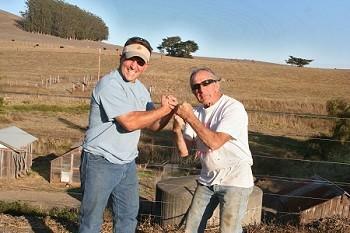 Next generation farmers like Loren Poncia and Bobby Foer are finding ways to stay on the ranch. The last generation of ranching families grew up in a strong commodity market, with the dairies selling to local and national creameries, and the livestock folks selling exclusively into the national, vertically arranged meat markets. Stagnant prices and high-risk economic cycles have been a huge challenge to these families, and the next generation has been reluctant to join the family enterprises that show little room for conventional growth. It’s much easier to leave the farm with a degree in ag business and find a well-paying job. But some of the kids are making a go of it. There are certainly more people venturing into a new marketing model than are listed in this article. So far we have featured Dave Evans, Julie Evans-Rossotti, Cindy Pomi, the Giacomini family, and of course, Albert Straus. Loren Poncia and Bobby Foer also need to be singled out as innovators and survivors on the family farm. Loren takes the lead role in diversifying the ranch by creating Stemple Creek Farms to market an ultra-premium, mature, grass-fed beef product in quarters and wholes to families. “We make a whole lot more profit doing it this way, but so far our market is small. But it's growing.” Loren is part of a vanguard of young ranchers tapping into the local and sustainable consciousness sweeping the Bay Area. “We know that people want quality. That’s what we are aiming for,” he mentions. Loren is planning to grow Stemple Creek Farms as the demand increases, and is spending more time on the family farm. He sits on the Board of Directors for the Marin Agricultural Land Trust and takes a keen interest in the development of sustainable agriculture in West Marin. By combining the innovation and entrepreneurship of modern niche market agriculture with the traditions of his family, Loren is a good example of where Marin agriculture is headed. Today, that is exactly what one finds upon visiting Coastal Hill Farms, on the family ranch where Bobby grew up learning about poultry from Grandpa Alfred. 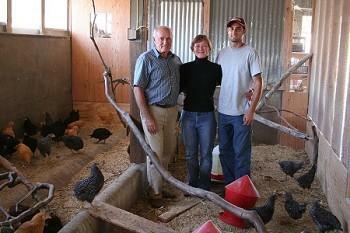 The place is absolutely spotless, in part because of Bobby’s mother, Alfreida, and father, Bob, who have pitched in to make the farm a paradise for the chickens. Bobby is raising laying pullets for those folks who would rather buy a laying hen rather than spending six months raising the birds from chicks. He is also specializing in premium quality fryers, and has just begun to market to the best restaurants. Coastal Hill Farm is tucked into a beautiful valley in West Marin, near Nicasio. Bobby is environmentally conscious and his operation shows it. 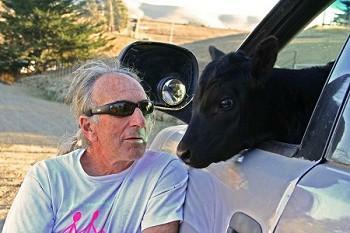 He feeds only California Grown grains and composts litter with cow manure from the ranch to create food for the earth. His care for the welfare of the birds is exceptional. The ranch also hosts cattle and a large family garden. Bobby’s operation has invigorated the Grossi Ranch in a really new way. He has rekindled the vision of his grandfather and is beginning to make a significant contribution to our local food supply. His determination and energy is the same kind of effort that his traditional farm family exhibited when they helped to build a ranching industry here in West Marin. Like Loren Poncia, Bobby is combining the old and new to perpetuate a healthy farming culture.